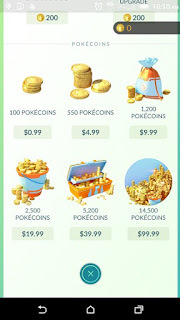 Pokémon GO is indeed a free mobile video game, but you can buy all items in the game with in game currency Poké Coins / Tokens, which you can buy for real money as well as you can earn in the game. If you are an advanced Pokémon Trainer then you can also get namely Poké Coins on the defense of combat arenas / gyms. In Pokémon GO, you should take on Gyms if you want to earn Poké coins without spending real money. - Take on gyms in your local area. Some may stand empty while others are occupied by Pokémon. - Once you have taken a gym, use one of your best Pokémon to defend it. - Every time your Pokémon successfully defended the gym against an opponent's Pokémon, you will receive a bonus. - You can deploy your team, your Pokémon at a friendly gym. - A Pokémon stationed, per day you will receive a reward in the form of 10 Pokécoins and 500 stardust. - You can assign 10 Pokémon and earn maximum 100 Pokécoins and 5000 Stardust per day. - To collect your reward, in-game shop you have to tap the shield icon in the upper right corner. If you need fast Pokécoins to buy items, then of course you can also invest real money. The following table shows you the rates for the individual coin packs in the game.